Every organization should have emergency medical information on file for each employee and volunteer. In the event that someone gets hurt, it is imperative that you notify someone close the injured person as well as 911 dispatch and paramedics. Use this emergency medical information form template to help you gather and organize the information you need should such an unfortunate incident occur. The first step to getting the information you need for your organizations’ emergency medical contact files is to download the emergency medical information form template. The template is free to download, and you can get it right from this page. The information included in the template is customizable. 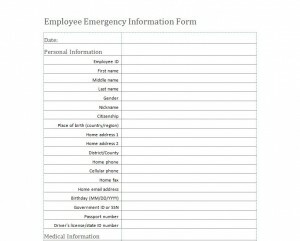 Change the information your organization requires for its employee emergency information form on the template. Not all of the information categories may apply. Delete the ones that are unnecessary. Distribute the form to all of your employees. Include volunteers if you work for a non-profit organization. Consider distributing the form electronically to enable employees and volunteers to return it quickly. If you add or change information categories on the emergency medical information form, try to keep it to just one page. This reduces the time burden of filling it out for employees and volunteers. Doing so also decreases the time that you or another staff member will have to scan through the form to find needed information to give to next-of-kin or emergency personnel. Update the form at least each year. This will ensure that the information you have is correct and up-to-date. Send out reminders during the year to notify you if their personal or medical information or emergency contacts change before the annual update. Consider adding email addresses or instant messaging IDs to the emergency contact for each person to increase the number of ways you can reach him or her. Double check each form for legibility and completion before you file it away. Keep a copy of employees’ and volunteers’ photo identification with the form for verification purposes should an emergency arise. The emergency medical information form template is a good way to organize your human resources department’s response to employee emergencies. Knowing which medications your employees take and any allergies they have, for example, can speed up the proper care they receive from paramedics and doctors. This template is a helpful tool for reacting quickly and effectively to a workplace emergency.